Love video games? Ever wonder where that old Defender game from the 80s came from? Want to know more about how video games work and the industry in general? Well, then, I have a movie for you. Called The Name of the Game, we have the first trailer and a pretty cool poster for this insider's view into the world of electronic mind manipulators and one of the world's favorite past times. The Name of the Game will be out in the U.S. on November 30th. 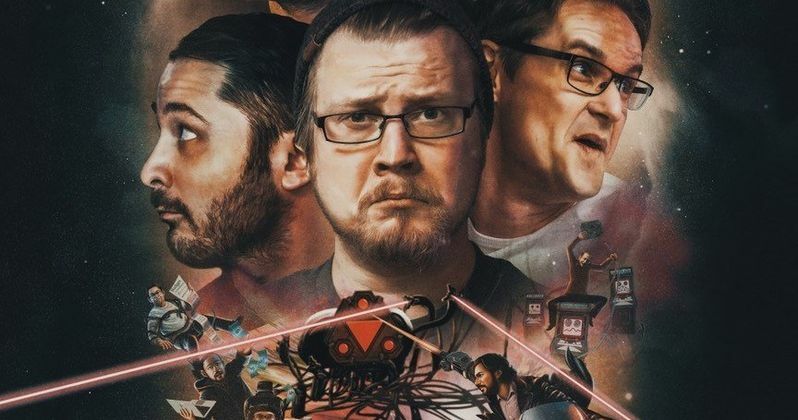 The film gives unprecedented access into the video game industry, documenting the collaboration between legendary arcade game designer, Eugene Jarvis, and the Finnish game developer, Housemarque. Gunpowder & Sky's Filmbuff and media brand Futurism are teaming up to release the Finnish documentary The Name of the Game worldwide. The Name of the Game main character is Eugene Jarvis, whose 1980 debut of Defender became one of the biggest successes of the golden age of arcades and one of the few to gross over $1 billion. Defender has remained a cultural mainstay decades later, after recent features in Ready Player One and the Guardians of the Galaxy films. Eugene's also known for creating other hit games like Robotron, Smash TV, Narc and Blaster. His partnership with Housemarque, one of the top modern arcade game houses, allows the filmmakers to showcase to audiences the incredible collaboration, dedication and technological innovation needed to bring these digital worlds to life. The film was co-directed by Paul J. Vogel and Jarno Elonen, produced by New Dawn Films in association with Futurism Studios. The film is written by Heikki Kareranta, produced by Jirka Silander, and executive produced by Geoff Clark and Jason Taylor of Futurism Studios. Says director Paul J. Vogel. "Having been an avid gamer all my life, the opportunity to follow an established video game studio on their collaborative journey with no one else than the legendary arcade designer Eugene Jarvis made my inner-child do backflips. Most people enjoy games but put little thought into how much effort and struggle is put into getting those experiences into hands of consumers. I really hope The Name of the Game can shed some light on that." The film is distributed internationally by Gunpowder & Sky's Filmbuff and available to watch today on iTunes, Amazon Video, VUDU, Google Play, Microsoft Movies & TV, STEAM, and Vimeo. Futurism Studios is the content production and distribution strategy studio founded by the Brooklyn-based online content and news provider (Futurism) that covers the breakthrough technologies and scientific discoveries that will shape humanity's future. For more information visit www.futurism.com. You can take a look at the first trailer for The Name of the Game. The team behind the documentary also whipped up a pretty cool, attention grabbing poster that features all the main players in this deep dive that examines the video game industry from the inside out.